Many online sellers freak out if they have one competitor selling the same item. Well, how about if you have thirty - count 'em, 30! 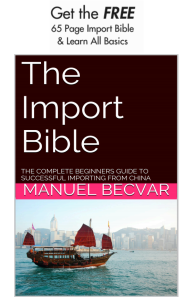 Trusted importing and Amazon expert Manuel Becvar aimed to find out. Using his own money. And he's almost sold out of his inventory! Becvar is author of the recommended Import Bible (free) and head of the Import Dojo training program I endorse. > Shortcuts don't work. Importing an item, slapping a label on it, and expecting 45% ROI immediately is not going to cut it. The 50% I mentioned above? Yeah they're doing just that. You have to 'own' your product and process like you are facing 30 competitors. > You need a little (inexpensive) help. There is software and services that will help you (legitimately and without violating Amazon's policy) with 1.) traffic, 2.) buyers, and 3.) reviews. Manual reviews some of them in the same article. They require a very small investment. Try them. Alternately, do what your competition is doing - just crossing fingers and hope 'it sells'. Manuel’s course is the best I have done and that includes the big dollar courses ( have done several ). Step by step makes such a difference. Have not met him in person (yet) but such a nice guy online and so helpful. “He walks the walk and talks the talk”.